Santa Claus is coming to town! And honestly? I can't believe it's TONIGHT! We didn't want Santa and his reindeers to go hungry while delivering all those gifts so we set up quite the assortment and decorated with eucalyptus creating a festive table that also smelled really fresh and wintry. Cookies are a no brainer. But how about topping them on a bed of rosemary? We do so much extra cooking over the holidays and fresh herbs are a staple in our fridge. So we used sprigs of the greenery to line our trays with. We absolutely love Aunt Debi's Chocolate Bark and it's the easiest dessert ever to make. So not only did we whip some up but we thought it would be fun to set out containers that Santa could use to take home leftovers. 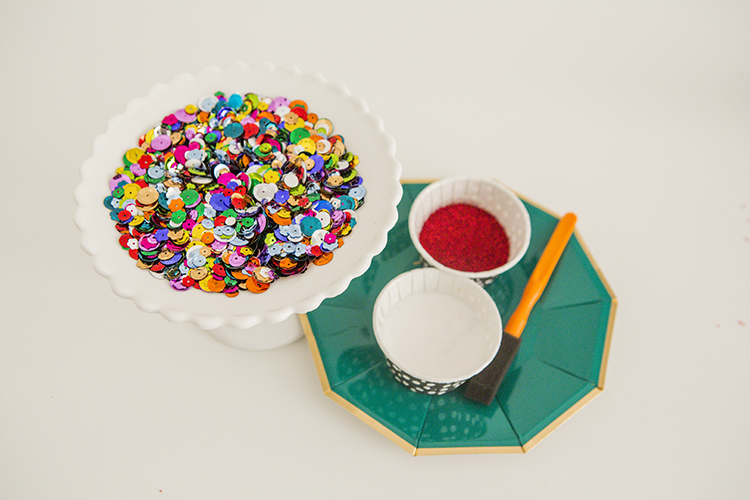 We used wanted to glam up our Glad lids and did so by painting them with glue and then covering with sequins. They turned out SO gorgeous and were so fun to craft! Earlier in the week Mommy Shorts was giving a tutorial on making reindeers 3 ways so we snagged her leftovers and styled them into red sixlets and on little cupcake stands. How cute?! Now what is Santa gonna sip on with all these sweets? We can't get him drunk because he's gotta drive that sleigh and finish his job for the night so how about a cold cup of milk? Obviously we put it into a cute glass bottle with a pretty paper straw. Then to put a spin on our sweets...we served chocolate covered marshmallows. These are truly as easy as it gets. Melt chocolate, dip the marshmallow directly into the bowl of melted chocolate and give it a swirl or coat the marshmallow with the back of a spoon. Hit them with some sprinkles and then set onto wax paper. We added festive straws as sticks to make these marshmallow pops and put these into containers lined with plaid fabric for Santa to take on the road with him. If you're hosting a cookie swap and plan to use any of these sweet eats - add a hangtag with the name of your dessert included so your guests can easily identify each dessert when they bring leftovers home and can then follow up with you for the recipe if they wish. Another fun DIY is to glitter your take home containers. We coated the bottoms of our Glad containers with glue and then covered in glitter shaking off the excess onto a paper plate to avoid a big mess. How sparkly and festive are these? Whether you're sweet or salty, we hope you get all you wished for from Santa tonight. Merry Christmas Y'all! The photos in our post here were taken by the ever so sweet Dave Robbins Photography. And you can find more on our sweet eats in the Gather Now Tumblr Feed found here.